In our December 2012 Census of Facebook Users in Malaysia, we included a comparison of likes for Pakatan Rakyat (PR) and Barisan Nasional (BN) for users aged above 21 years old. This did not explicitly include any politicians’ Pages. 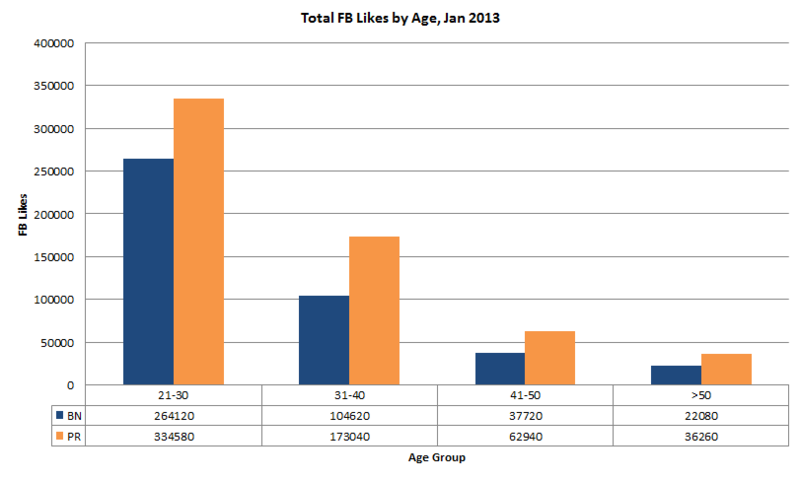 PR has more likes than BN in every age group. PR has more male and female likes than BN in every age group. However the gap is narrow for female likes, which means BN can overtake PR in likes from potential women voters. BN likes have grown at a faster rate than PR in November, narrowing the gap between both coalitions. PR has more male and female likes than BN in every age group. BN likes grew at a faster rate in December compared to November, for both men and women. 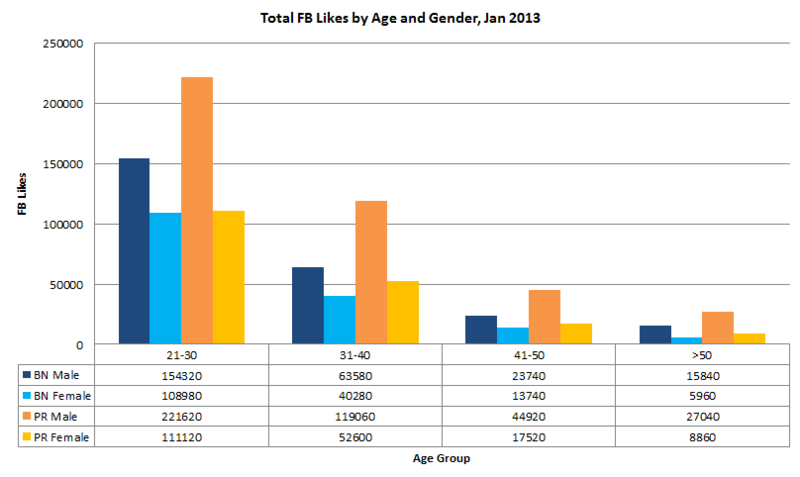 BN gained more likes than PR in every age category for both men and women. PR likes grew at a faster rate in December compared to November, but only for men. For women, PR’s growth rate reduced from 14.98% to 3.29%. 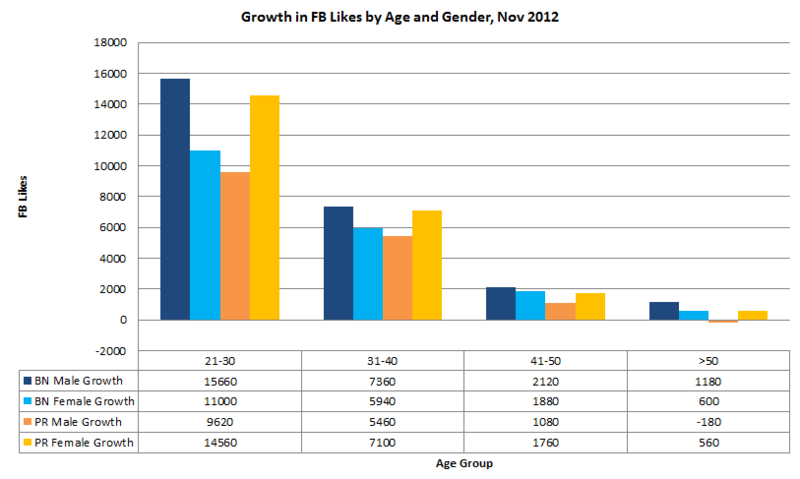 For women aged 21-30 years, PR growth was 14560 likes in November. In December, PR growth was only 1520 likes. This reduced growth rate applies to all age categories of women. 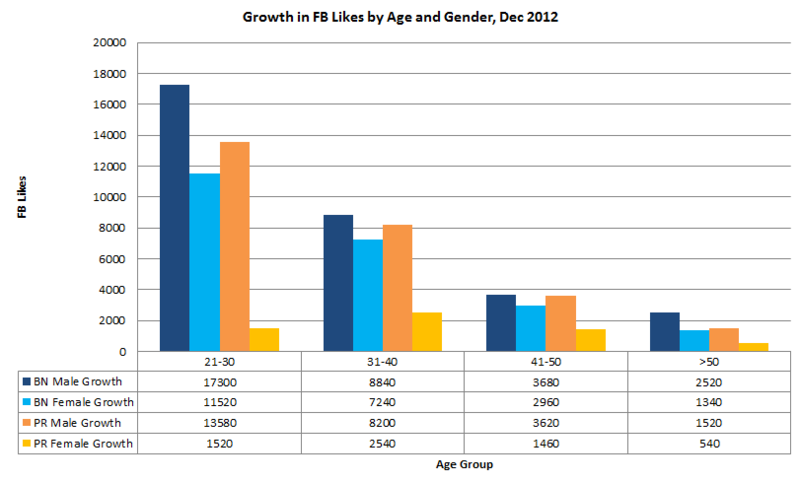 The gap for female likes has reduced further, with BN only 2160 likes away from overtaking PR for women aged 21-30 years. PR’s fan-base has become more male-dominant, with the male/female ratio shifting from 209:100 to 217:100. BN’s fan-base has become less male-dominant, with the male/female ratio shifting from 154:100 to 152:100. What did PR do in November to gain such a high increase in likes from women? What did PR do in December to increase its growth rate in likes from men, but greatly reduce its growth rate in likes from women? What did BN do in December to increase its growth rate in likes from both men and women? Facebook’s advertising tools were used to collect data on the number of likes for each topic. The results are an estimate by Facebook based on the search criteria we used. We found the margin of error to be +/- 0.1%, though this can vary based on the topic. Himpunan Kebangkitan Rakyat (People’s Uprising Rally / #KL112) was a protest rally held at Stadium Merdeka, Kuala Lumpur on January 12th, 2012. It was organised by Pakatan Rakyat and various NGOs. At its peak the crowd is estimated to have been between 63,976 – 78,193 people. This number is not expected to be revised, unless some new evidence surfaces to suggest a different crowd size. Photos and videos that showed the size of the crowd were evaluated. These were used to determine the extents of the area covered by the crowd and the crowd density. The area was then refined by removing obstacles and estimating the percentage of space used. A crowd density of 4 – 12 sq.ft. per person was used. 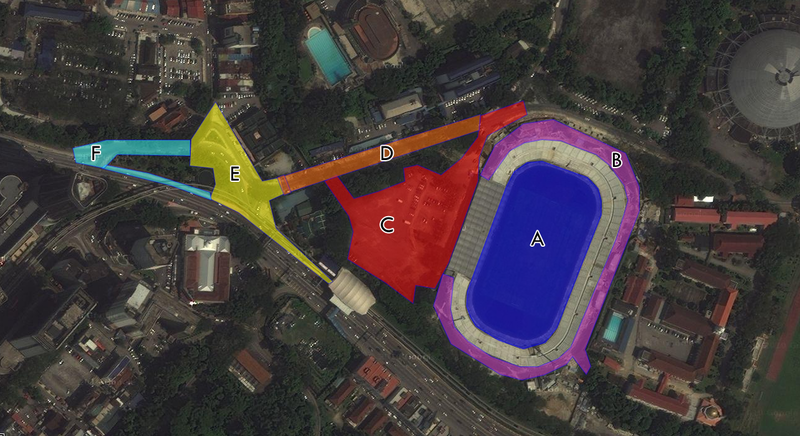 The polygons in the map below shows the extents of the crowd, divided into different zones. The total space covered by the polygons is 456,627.05 sq. ft. The space taken up by the crowd is 275,532.03 sq. ft. These measurements do not include the stadium seating. Margin of error is +/- 10%. The estimated size of the crowd is 63,976 – 78,193 people. The following is the executive summary, included in the Scribd document above. This document describes the population of Facebook users in Malaysia based on public information collected from Facebook. The goal is to provide a point of reference for social media marketing and a report on Malaysian interest in politics. Personal characteristics and interests in topics such as Pakatan Rakyat (PR), Barisan Nasional(BN), coalition leaders, Bersih, 1Malaysia and both mainstream media (MSM) and online alternative media publications were measured by age group and gender. Users interested in a topic are considered the fan-base for that topic. Research focused on potential voters (users aged 21 years and above). Malaysia has a total population of 13.5 million Facebook users. The population is male-dominant – 53% are male and 47% are female. Out of the total population, 9 million are potential voters – 54% are male and 46% are female. Results of the analysis show that men are more interested in politics than women, but the overall population has little interest in politics. Only 8.8% of total potential voters expressed interest in PR and BN parties. Female bias was present in the fan-base for Malay-language MSM, Chinese-language MSM. Female bias was strongest in the fan-base for 1Malaysia. Male bias was present in the fan-base for English-language MSM and Barisan Nasional parties. Male bias was strongest in the fan-base for Pakatan Rakyat parties, Bersih and online alternative media. For female-dominated topics, there is 1Malaysia and Malay-language MSM. The 1Malaysia brand is associated with BN and Malay-language MSM tends to give more coverage to BN parties. For male-dominated topics, there is PR, Bersih and online alternative media. Bersih is a coalition of non-governmental organisations (NGO) seeking electoral reform. Bersih is strongly supported by PR. Online alternative media tends to give more coverage to PR parties compared to mainstream media. PR’s fan-base is 1.5 times larger than BN’s fan-base. However the gap between BN and PR is small when it comes to women and PR’s fan-base is more male dominant compared to BN. This means that BN can overtake PR when it comes to potential women voters. Population growth in November showed that both BN and PR’s fan-base were becoming less male-dominant. However BN started with a more favourable position in terms of gender balance. Both 1Malaysia and Malay-language MSM have a female-dominant fan-base, which is a good market for BN to draw users from. PR does not have a female-dominant source to draw from. Bersih and online alternative media are too male-dominant. The main source left to draw from are women who currently do not show an interest in politics, which is a challenge faced by both coalitions. This places BN in a better position than PR to increase its share of interest from potential women voters.